The Bona Mop is a durable, premium spray mop that every household should have. It combines the Bona MicroFiber Mop with a floor cleaner cartridge so you can have the mop and cleaner all in one. It’s quick, easy to use and leaves no dulling residue. * GreenGuard – Children & Schools certified for indoor air quality. 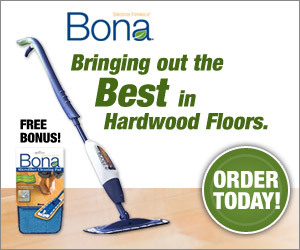 Buy the Bona Mop today and get an extra free pad. Internet special only!